As we congregated in the shared living space of our B&B for a hearty breakfast on our first morning in Banff, Jeff, Charlie and I conversed with the diverse array of guests about the day’s plans. Here you had the friendly older couple on holiday from Winnipeg, the young executive in town on business, and the large family group from Ireland. The common theme among everyone was plenty of hiking. 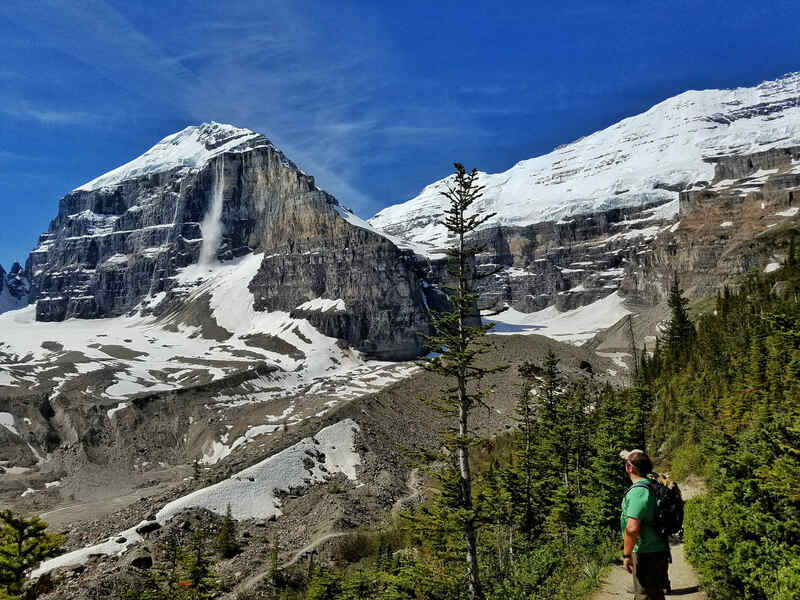 The goal for the three of us on this particular day was to tackle the famous Plain of Six Glaciers trail in nearby Lake Louise. 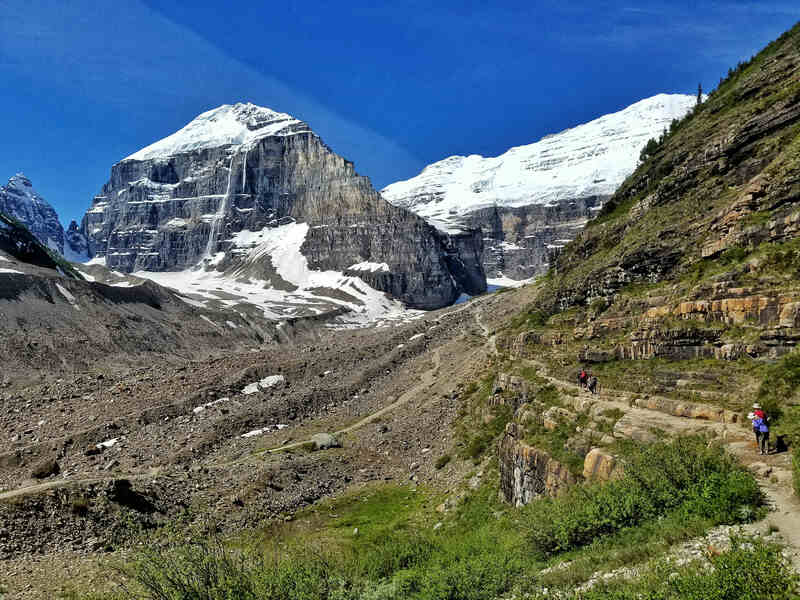 As we exchanged pleasantries with our fellow guests over a hearty breakfast of omelets, yogurt, and potatoes, it emerged that most had either already done the Plain of Six Glaciers trail, or were planning to do it in the coming days. The takeaway from the conversations was that this was certainly a hike not to be missed. 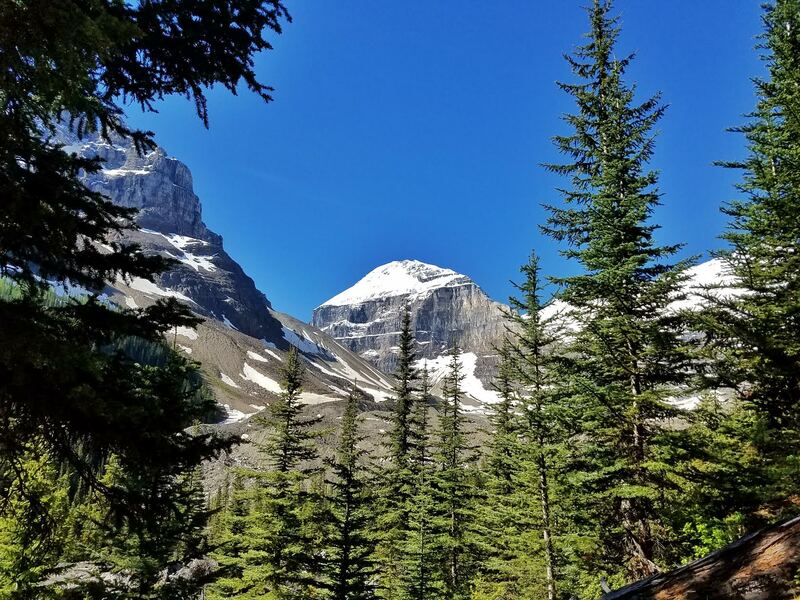 In planning our trip into the Canadian Rockies, there were 2 major hikes that most intrigued me: The aforementioned Plain of Six Glaciers trail in Lake Louise, and the Larch Valley trail above nearby Moraine Lake. 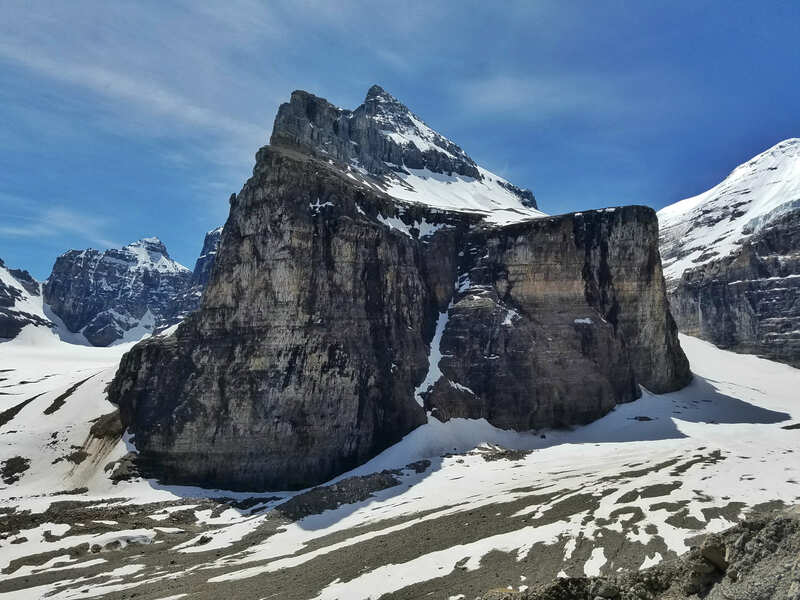 It was difficult to decide on which we should embark upon first, but I eventually settled on the Lake Louise hike first, with the Moraine Lake hike on the following day. The first order of business was a hearty, protein packed breakfast to provide the fuel for the 5 hour hike to come. 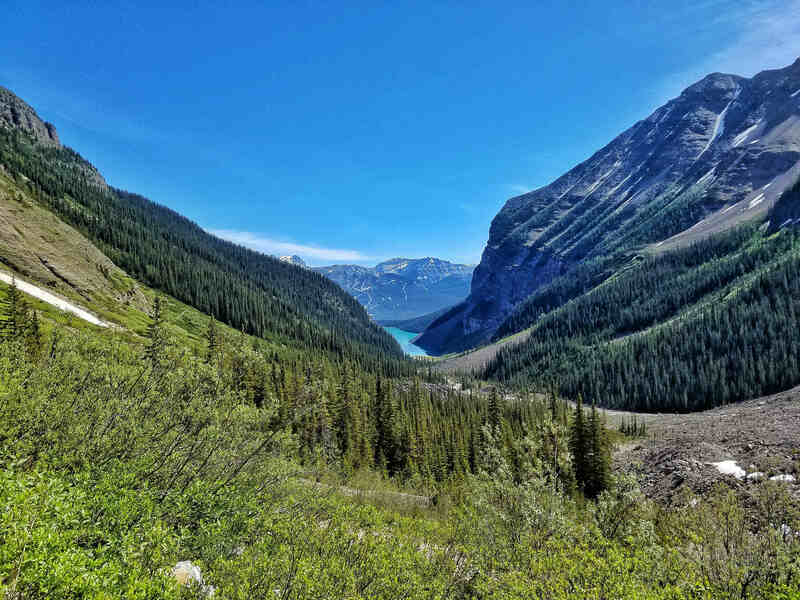 If you are using Banff as your home base during your stay in the rockies, as we were, the drive to Lake Louise is a quick and scenic one, only taking around 40 minutes to get there. 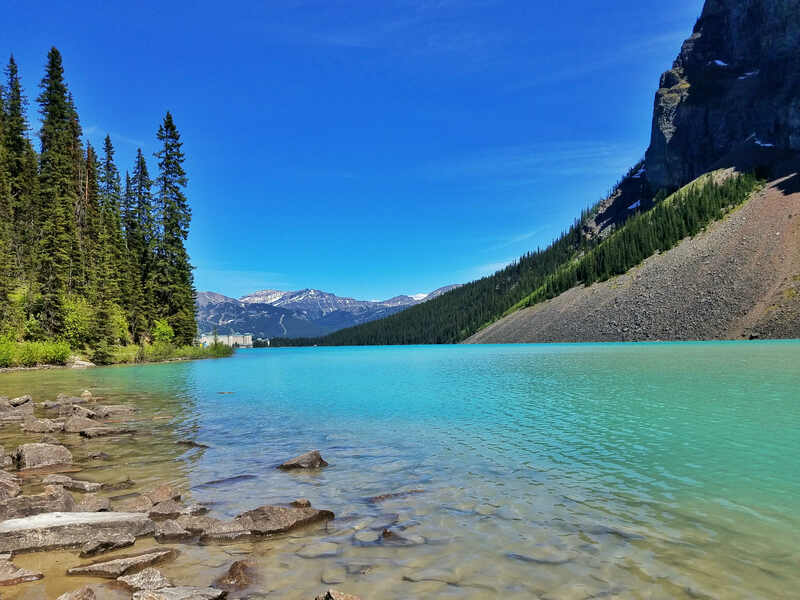 My advice if traveling to Lake Louise is to arrive early, as this is one of the most popular places to visit in the area. 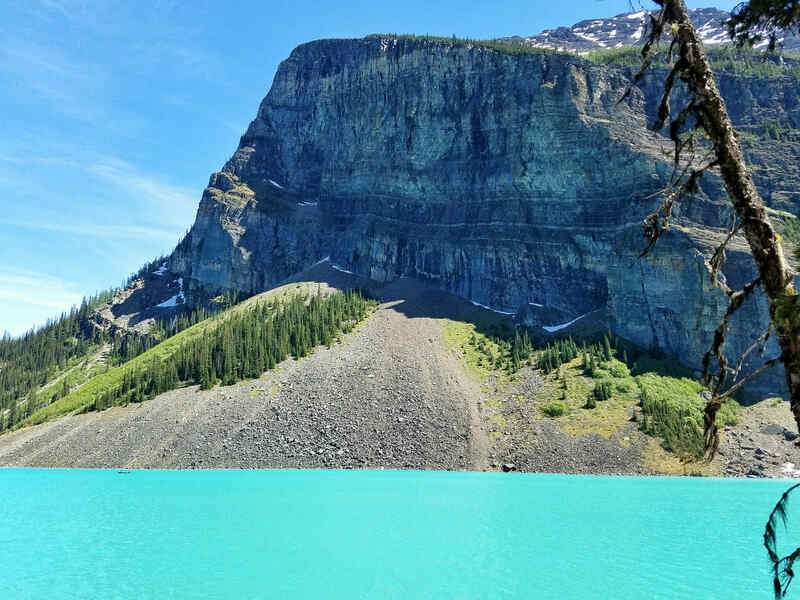 People are drawn to the electric blue waters of Lake Louise, and I must admit that I too was drawn to this stunning location from all the photos I had seen online for years prior to our trip. 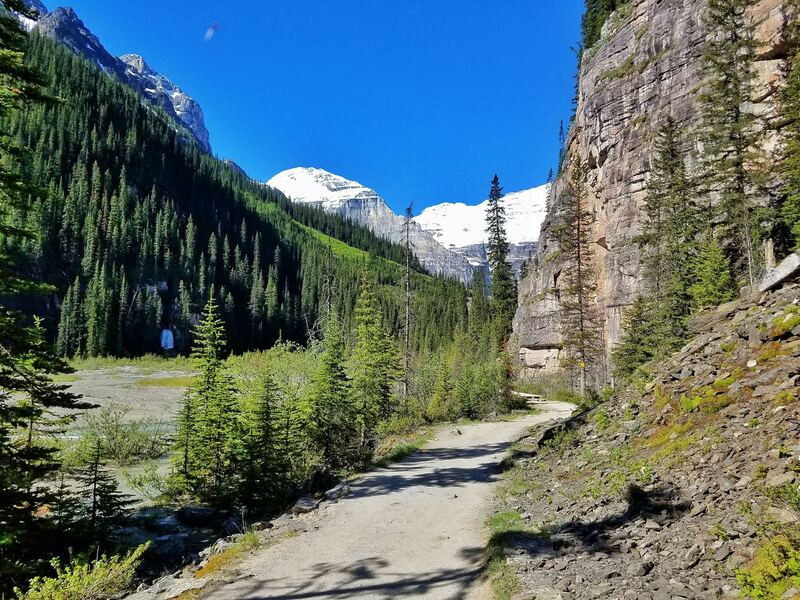 The path here that wraps around the lake is the one that takes you to the trailhead for the Plain of Six Glaciers hike, and is where our adventure began. By the time we reached the opposite end of the lake, the number of people had thinned to just a few people, and the whole effect was one of serene calm and a feeling of oneness with the nature surrounding us. Glancing back, you could see the famous Chateau Lake Louise growing smaller in the distance, set amidst a jaw dropping mountainous backdrop. As we entered the beginning part of the trail, we were surrounding with towering, sheer rock walls rising vertiginously up into the sky, hundreds of feet above our heads, with daring rock climbers adeptly clinging to it’s face, slowly making their way to the top. We were all three quite content in keeping our feet planted firmly on the ground at this moment. In the distance, the top of Mount Victoria peeked from behind some larch trees, and would serve as the ending point of this hike. The further we walked along the trail, the more incredible the views became. As the mountain grew larger and closer to us, we began to notice the thick sheets of snow and ice precariously clinging to the top, which would periodically break loose and tumble down the sheer side of the mountain, creating a thunderous noise similar to that of a jumbo jet engine, that would echo all around us. Jeff watching, spellbound, as nature did its thing. At first, we were amazed to have been witnesses to such an incredible and rare event, before long coming to the realization that this was no one-off thing, but would happen every 5 – 10 minutes. It never got old, and we would stop each and every time to watch and take it in. As the trail continued to meander along, we passed streams, waterfalls, and all manner of wildlife, eventually leaving the trees behind as the landscape became a bit more rocky and barren, revealing in full the valley below the mountains, long ago carved out by the glaciers that gave this trail its name, and filled with the boulders carried and left there by long retreated glaciers. 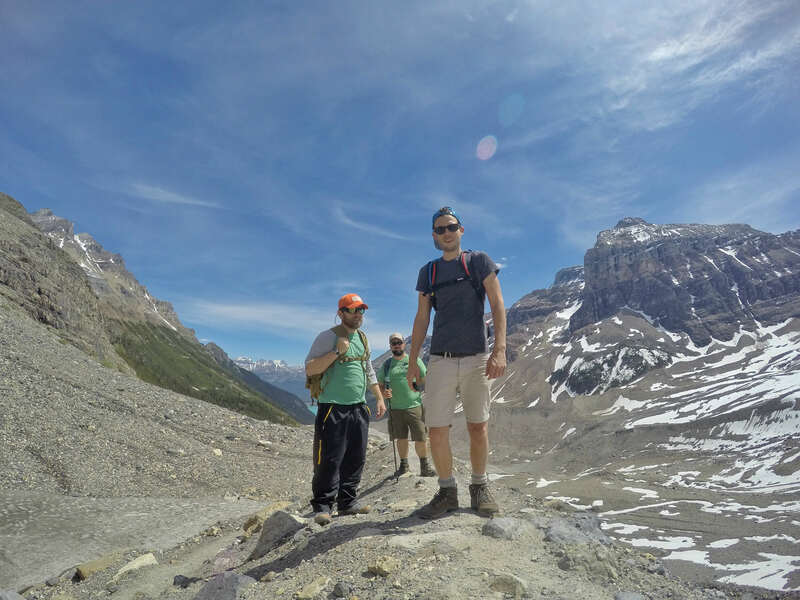 Behind us, tiny Lake Louise, now barely visible served as a visual remind of just how far we’d come. We eventually found ourselves at the Tea House, and replenished our reserves with snacks and tea. After ordering the chips and salsa, I had my first encounter with the Canadians’ seeming love for Pace picante sauce. For the remainder of our trip, any time I was served salsa, it was always undoubtably the mild, sugary, glorified ketchup that can barely be categorized as salsa. 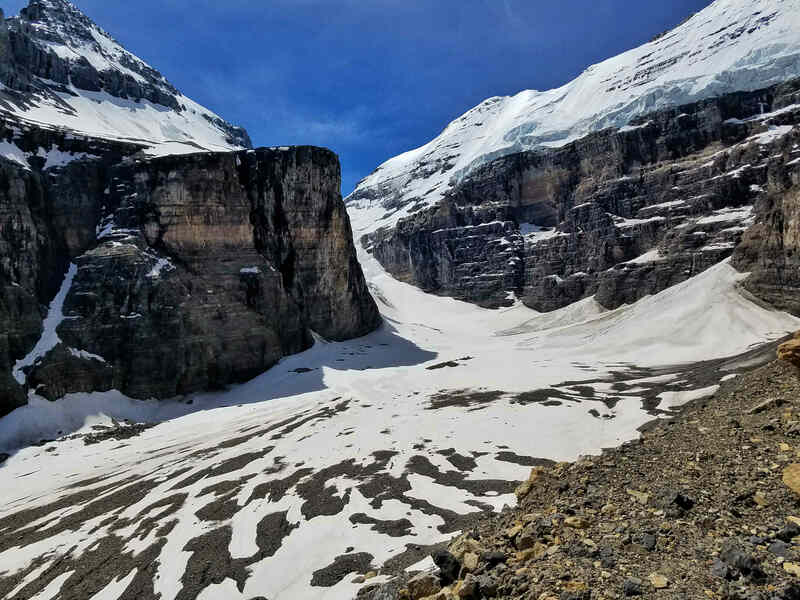 We wondered how the wait staff gets here each day, as the hike from Lake Louise to this point was a pretty vigorous 3 hour or so hike, and surely they did not hike in and out every day to go to work. After asking this silly question to our server, she informed us that the staff rotates out each week – they hike to the Tea House, and there they stay for the whole week, sleeping in the quarters just behind the teahouse, before hiking back out as the new staff comes in to take their place. Food and supplies here are replenished regularly by helicopter delivery. We sat here for about half an hour before taking a few photos from the viewpoint just next to the teahouse before continuing onward. 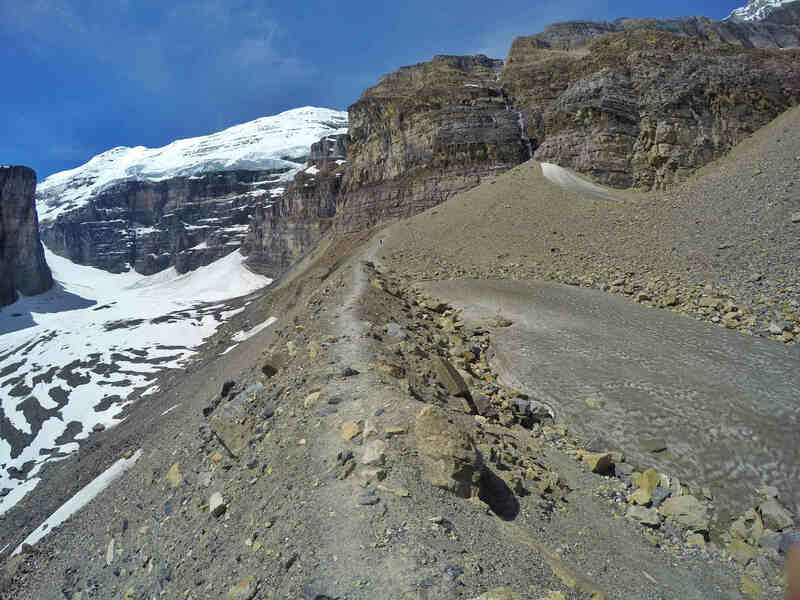 At this point, most people will head back toward Lake Louise, returning the same direction from which we had just come. However, we continued onward from the teahouse, as the trail continues on for another kilometer and a half further, and was well worth the effort we had been told by many others. 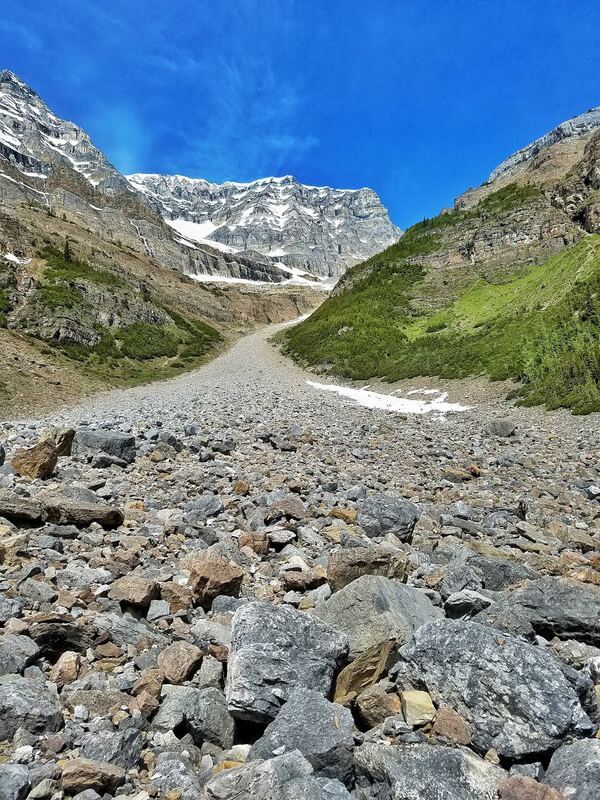 Just past the teahouse, we ambled over the rocks and boulders of a giant river of scree that emerged from a nearby mountain. Just past this point, the views really opened up onto the valley below us, and the glacial views begin to reveal themselves to us. The path continued along a very narrow ridge, with a vertiginous drop down to the basin below us, creating a dizzying effect as we walked further along the trail. Eventually we reached the end of the trail, where we found a literal dead end. Here was a great place to take a seat and gaze out across the pass to the hanging glaciers directly in front of us. At this point, after scrambling our way up the steep embankment of loose rocks, we came to a cascading waterfall of snowmelt that tumbled from the top of the cliff far above us, where Jeff, the brave adventurer that he is, stood upon a wet rock just below the falls, and hundreds of feet above the valley floor for an up close and personal look of the waterfall. I myself was content to settle onto a rock, and not get any higher up or closer to the falls, and serve as Jeff’s photographer. 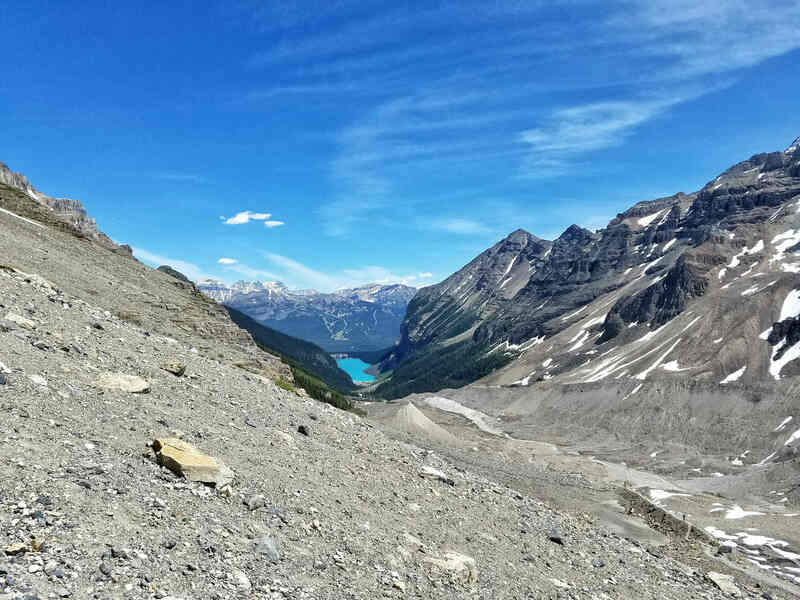 After hanging around the viewpoint and gazing out at the sweeping vista that laid before us, we began the long slog back the way from which we had ventured, and made it back to Lake Louise. The total time, out and back was approximately 5 and a half hours, with plenty of stops along the way for photos, views, and tea. 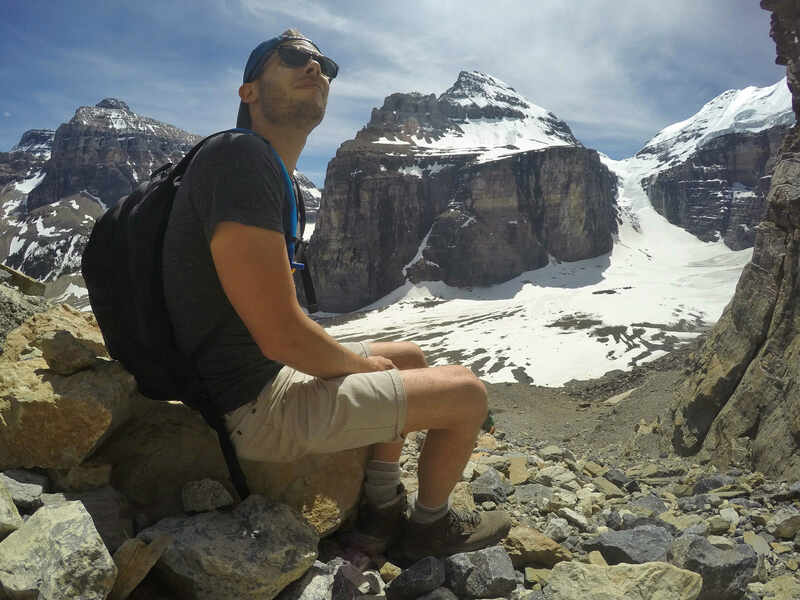 We all agreed that this was one of, if not the best hike we had ever done, due to the sheer number of epic views, and we couldn’t possibly imagine how another hike could ever impress us as this one did. The hike that would follow the next day above Moraine Lake would certainly present a challenge to that assertion, as we would soon find out. Difficulty: Considered a “moderate” hike, anyone in decent shape should have no problems completing this hike. Highlights: Stopping at the Tea House for drinks and snacks to replenish your energy reserves for the return hike to Lake Louise; I strongly suggest continuing on the trail past the teahouse for an additional 1.5 km for an amazing viewpoint of the Abbot Pass, where you will witness continual avalanches, and see a cascading waterfall of snowmelt from a high cliff above you. Tea House Information: Opens in early June, and remains open until October, depending on weather conditions. I agree that this has to be one of the top hikes anywhere! The vistas are just amazing and it looks like you were blessed with beautiful blue skies! We were totally blown away by this hike. Then the next day we did the Larch Valley trail at Moraine Lake, and couldn’t figure out which was more amazing. So many great things to see all over this area! 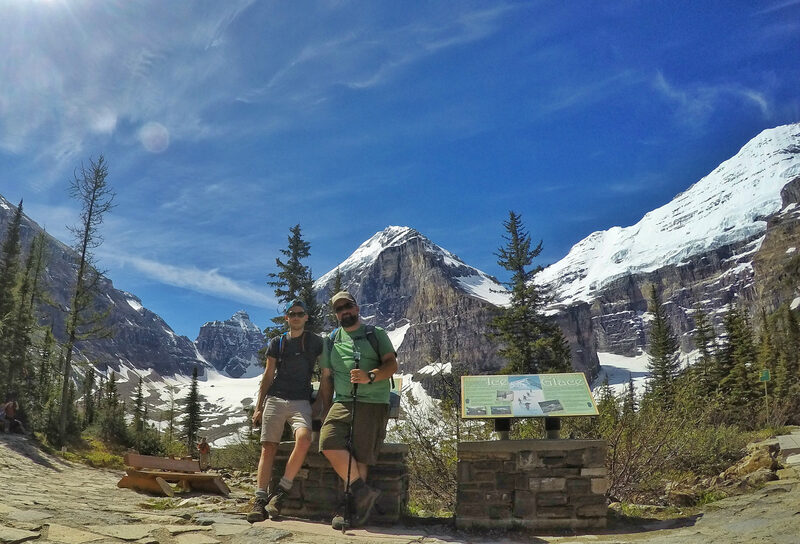 Thanks for sharing your photos, Stefan – wasn’t it just a fantastic hike? Even with clouds the scenery is just incredible! This looks amazing. The colors of the lake is just unreal. Thanks for including the highlights. Will keep that in mind if we ever end up here. Thanks for inspiring me to plan a return trip. 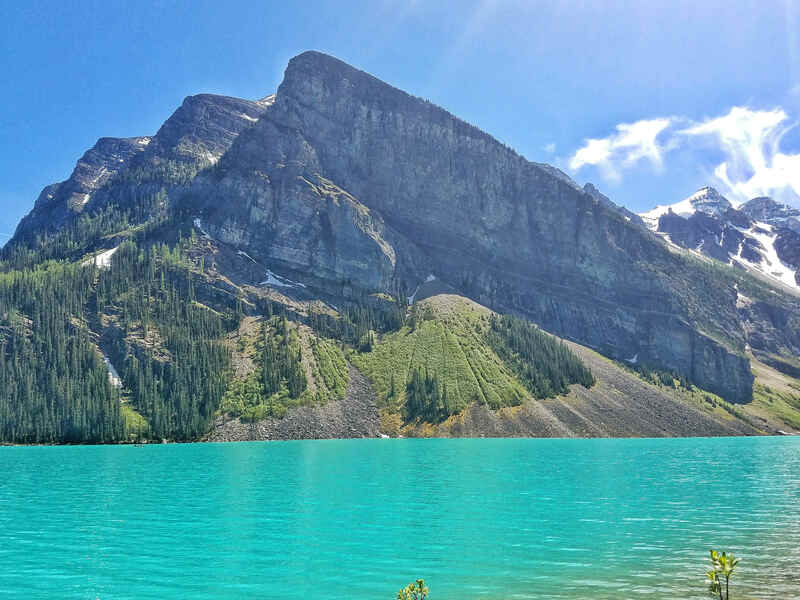 Lake Louise is one of the most stunning lakes I have ever visited. I also appreciate the hiking information- great post! 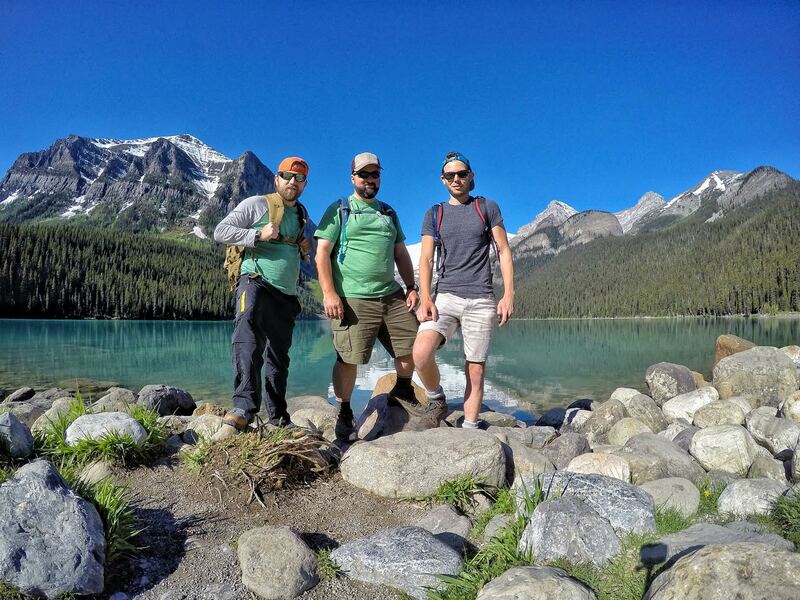 Isn’t Lake Louise the best? I’m planning a return trip as well, next time to bring my wife along with me She would love it! Wow! What a beautiful lake and hike! Lake Louise is absolutely stunning. I really want to go! 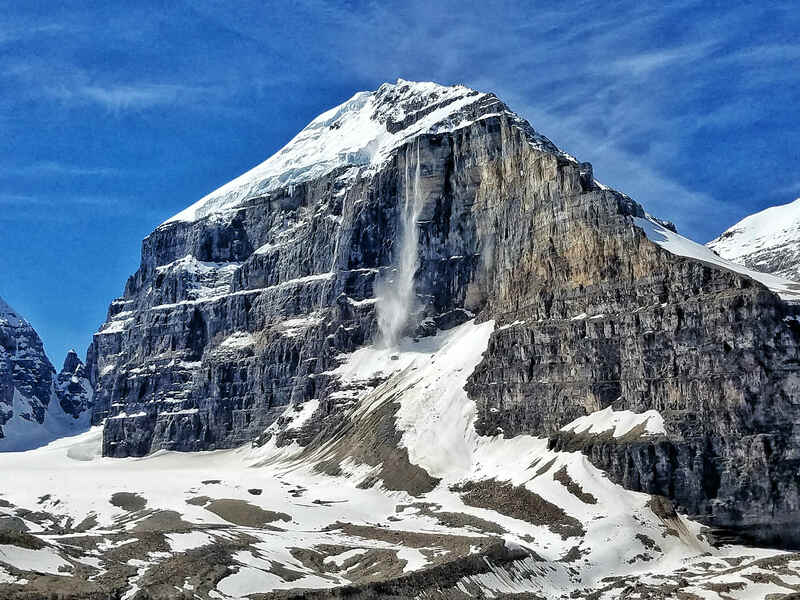 You should absolutely try and make it up to that part of the world at some point, Lake Louise was only the tip of the iceberg in terms of crazy beautiful scenery! Also, it’s pretty cool the staff of the tea house hikes in for a week at a time. That’s certainly a unique commute! That is a waaaaay better commute than being stuck in traffic in the car for sure! And great exercise! Canada – oh how stunning everything looks. Being in Boston, we’d love to visit this country someday. Plus, this seems like a do-able hike! What would you pick as your favorite part of this trail? 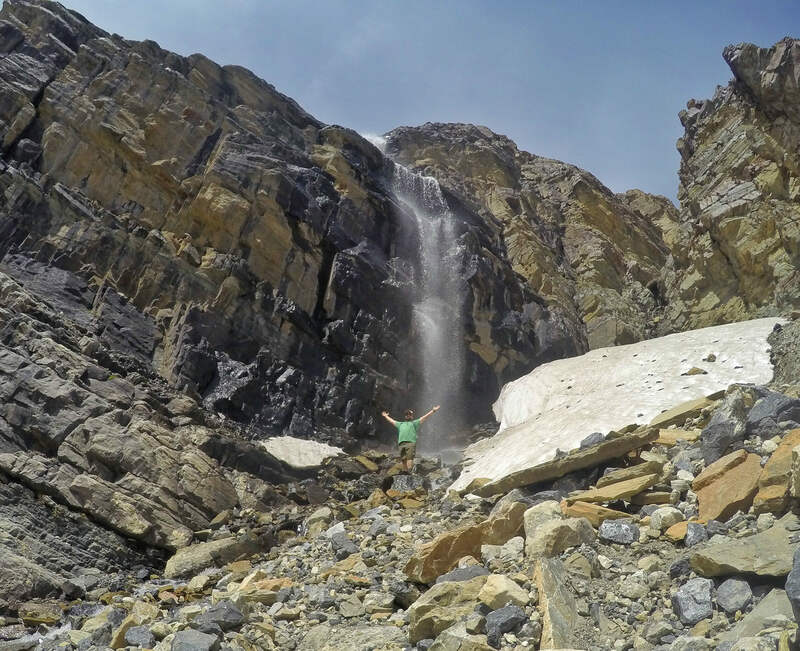 You would love this hike, Supriya, it is very do-able! The best part to me was the 1.5 km stretch that continues on just past the teahouse. Most people skip it, but they’re missing the most dramatic scenery, in my opinion! I can’t get enough of these photos! Talk about stunning. I love that there is a place up the trail to stop, refuel and just take it all in. It’s interesting to hear how the staff get to work every week. Talk about commitment! And I’m curious now to see the hordes of tourists congregated around the lake! It certainly is a gorgeous sight. The pictures don’t even begin to give the beauty of this trail justice – it is a must do if you’re ever in the region for sure! 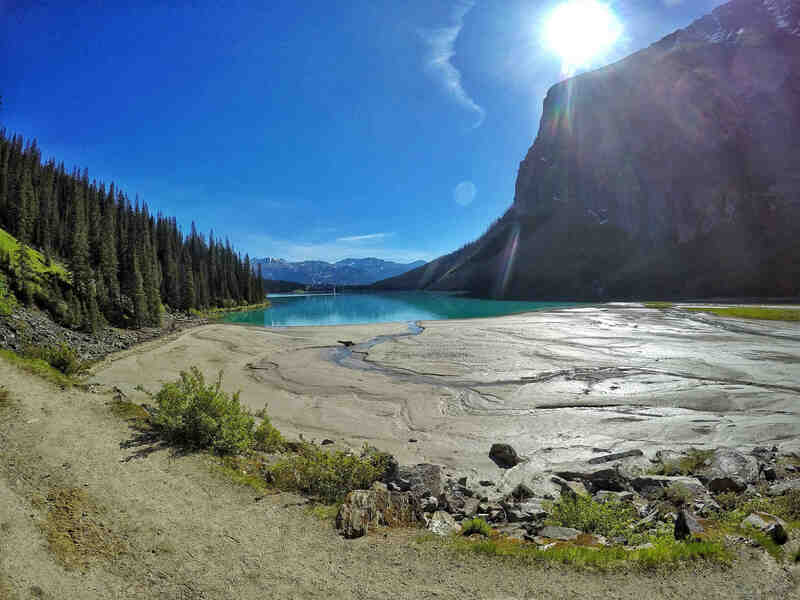 so want to get to the Canadian Rockies, we loved Whistler, but didn’t have time to get to Lake Louise, soooo beautiful! That is a fun fact about the cafe staff, quite a commitment! Whistler is definitely on my shortlist of places to visit soon!